After a highly successful world premiere in the 2013 Philly Fringe in September and an extended post-Fringe run in the fall, Jeffrey Stanley is back with Boneyards: The Wienering is back this summer 2014 and features a special guest appearance by acclaimed New York-based performance artist Michael Wiener. P hiladelphia, PA – The ongoing seance-as-theatre experiment continues. After a highly successful run in the 2013 Philly Fringe and a post-Fringe extended run last fall, Jeffrey Stanley’s BONEYARDS is back from the dead to rock your underworld for 2 performances in late July. Come in from the heat and peacefully rest in a cool, dark, coal cellar. Same autobiographical, spooky show, same mouldering location, same real ghosts, but now featuring a visit from New York’s quirkiest experimental performance artist Michael Wiener who will be sharing the crypt with the show’s creator Jeffrey Stanley. BONEYARDS is back from the dead to rock your underworld. Four new post-Fringe shows in October just in time for Halloween. 10/17/13, 10/20, 11/2 and 11/3. Only 20 seats per show, get ‘em before they’re gone. And don’t forget to watch and listen to this historic first: a casting call for the dead. The first round of open auditions for the spirit world was held in the 1895 coal cellar using the famed P-SB7 AM/FM scanner for listening to EVPs. Here are the results. No tricks, no jokes. The transcript is also included along with a few afterthoughts but watch the video first. A sneak peek at BONEYARDS’ unique setting in the coal cellar of a 119-year-old storefront synagogue in South Philly. 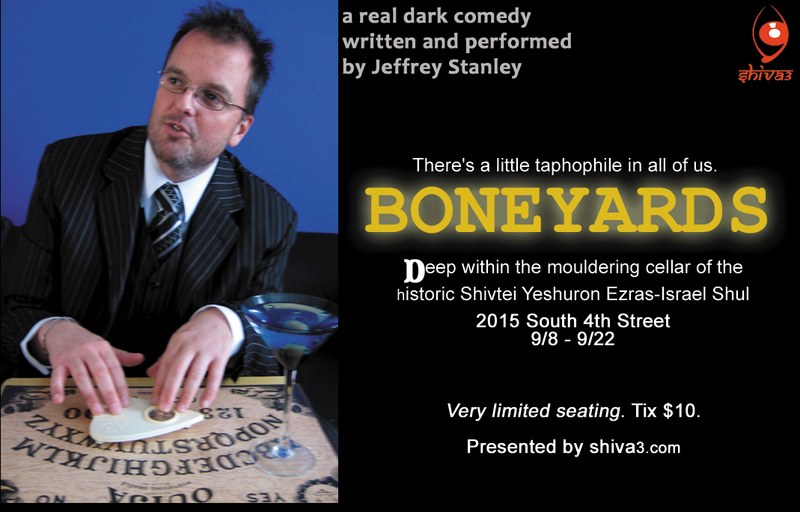 Philadelphia, PA – Shiva3 is proud to announce the world premiere of Jeffrey Stanley’s solo show BONEYARDS in the 2013 Philly Fringe this September. The 80-minute show will be performed in the dark, dank coal cellar of the century-old storefront Shivtei Yeshuron Ezras-Israel Synagogue, also known as “the little shul” (part of the June 2013 Hidden City Festival) at 2015 South 4th Street in South Philadelphia for 6 performances. The 7th and final show will take place outdoors at historic Laurel Hill Cemetery at 3822 Ridge Avenue.Stanley’s solo show is a followup to his 2011 Fringe hit BEAUTIFUL ZION: A BOOK OF THE DEAD, and began as a workshop while he was a 2011-12 artist-in-residence at Plays & Players Theatre. Stanley is a performing arts faculty at New York University Tisch School of the Arts and at Drexel University Westphal College of Media Arts & Design. He is also blogs about religion for the Washington Post. A funeral for the living. A coming-of-age embalming. A suicidal decapitation by coal train. A cross-dressing hillbilly named Doodlebug. This metatheatrical, taphophilic, true-to-life monologue resurrects and converses with the cadaverous–from Philly’s Laurel Hill Cemetery to a British colonial era graveyard in India to ancient Greek tomb worshippers.Is there a meaning to the universe? Is the spirit world speaking to you right now through this press release? If so it should be testable, no? Thrill as Stanley points to a tombstone and researches the forgotten dead beneath it, forming connections with the deceased who rise to the surface halfway around the world in a Kolkata graveyard, and in his own Appalachian family. Shriek and shimmy as Stanley worships the dead in song. Be amazed as a live seance yields messages for audience members. Psychism? Telepathy? Subconscious ideomotor impulses? Watch, decide, leave smiling, healed and redeemed. BONEYARDS. There’s a little taphophile in all of us. Similar to the Lower East Side Tenement Museum in New York City, Shivtei Yeshuron Ezras-Israel is an historic, century-old synagogue and hidden architectural gem in South Philly on 4th Street near Snyder Avenue. Audience members are invited to come 30 minutes early to wander the 3 story building before descending into the dark, dank coal cellar for Stanley’s macabre performance. Due to space constraints seating is limited to 20. The 7th and final performance will be held outdoors at the historic Laurel Hill Cemetery, the main inspiration for the show. His play Tesla’s Letters (Samuel French, 2000) premiered to rave reviews Off Broadway in 1999 and went on to national and international productions including the Edinburgh Fringe and most recently a Chicago premiere. Other plays include the 2003 metaphysical comedy Medicine, Man commissioned by the Mill Mountain Theatre in Virginia and most recently produced at Theatre Three Dallas, and Beautiful Zion: A Book of the Dead which premiered in the 2011 Philly Fringe. In the 2012 Philly Fringe he produced Bidisha Dasgupta’s classical Indian and modern dance show Einstein/Tagore: Seashore of Endless Worlds. Stanley is a past president of the board of directors of the New York Neo-Futurists experimental theatre ensemble, and a past board secretary at Plays & Players. He has been a resident of prestigious artists’ colony Yaddo, a Copeland Fellow at Amherst College, and a guest lecturer at the Imaginary Academy summer theatre and film workshop in Croatia sponsored by the Soros Foundation. He has appeared as a guest writer in The New York Times, New York Press and Time Out New York, and he was an editorial advisor to Boston University’s Center for Millennial Studies’ book on apocalypse movements The End That Does (Equinox Books, 2006). Stanley holds an MFA in Dramatic Writing from NYU Tisch and a BFA from Tisch in Film & Television. Doors open 30 minutes early to allow the audience time to wander the 3 floors of this century-old storefront synagogue before descending to the cellar. Tickets: $10, purchased only in advance through the Fringe Festival website, http://fringearts.ticketleap.com/boneyards. No tickets will be sold in person at the door. The 2013 Philly Fringe will take place September 5-September 22, 2013. Tickets prices range from free to $30, and can be purchased online at http://www.fringearts.com. The Festival Guide will be available the first week of August, and can be either downloaded as a PDF or picked up in hard copy at any Festival venue as well as at key “Hot Spots” (to be announced online in July) throughout the city. The Philly Fringe was founded in 1997. Today it serves as a collective home for artists bringing their work to audiences in every conceivable form–in traditional and untraditional venues, using new artistic forms and established ones. Philadelphia, PA – Shiva3 is proud to announce the world premiere of Jeffrey Stanley’s solo show BONEYARDS in the 2013 Philly Fringe this September. The 80-minute show will be performed in the dark, dank coal cellar of the century-old storefront Shivtei Yeshuron Ezras-Israel Synagogue, also known as “the little shul” (part of the June 2013 Hidden City Festival) at 2015 South 4th Street in South Philadelphia for 6 performances. The 7th and final show will take place outdoors at historic Laurel Hill Cemetery at 3822 Ridge Avenue. Stanley’s solo show is a followup to his 2011 Fringe hit BEAUTIFUL ZION: A BOOK OF THE DEAD, and began as a workshop while he was a 2011-12 artist-in-residence at Plays & Players Theatre. Stanley is a performing arts faculty at New York University Tisch School of the Arts and at Drexel University Westphal College of Media Arts & Design. He also writes first-person religion essays for the Washington Post. A funeral for the living. A coming-of-age embalming. A suicidal decapitation by coal train. A cross-dressing hillbilly named Doodlebug. This metatheatrical, taphophilic, true-to-life monologue resurrects and converses with the cadaverous–from Philly’s Laurel Hill Cemetery to a British colonial era graveyard in India to ancient Greek tomb worshippers. Is there a meaning to the universe? Is the spirit world speaking to you right now through this press release? If so it should be testable, no? Thrill as Stanley points to a tombstone and researches the forgotten dead beneath it, forming connections with the deceased who rise to the surface halfway around the world in a Kolkata graveyard, and in his own Appalachian family. Shriek and shimmy as Stanley worships the dead in song. Be amazed as a live seance yields messages for audience members. Psychism? Telepathy? Subconscious ideomotor impulses? Watch, decide, leave smiling, healed and redeemed. Philadelphia, PA – Shiva3 is proud to announce the world premiere of Jeffrey Stanley’s solo show BONEYARDS in the 2013 Philly Fringe this September. The 60-minute show will be performed in the dark, dank coal cellar of the century-old storefront Shivtei Yeshuron Ezras-Israel Synagogue, also known as “the little shul” (currently part of the June 2013 Hidden City Festival) at 2015 South 4th Street in South Philly near Snyder Avenue for 6 performances. The 7th and final show will take place outdoors at Laurel Hill Cemetery at 3822 Ridge Avenue. Stanley’s solo show is a followup to his 2011 Fringe hit BEAUTIFUL ZION: A BOOK OF THE DEAD, and began as a workshop production while he was a 2011-12 artist-in-residence at Plays & Players Theatre. Stanley is a performing arts faculty at New York University Tisch School of the Arts and at Drexel University Westphal College of Media Arts & Design. He is also a religion blogger for the Washington Post. A funeral for the living. A coming-of-age embalming. A suicidal decapitation by coal train. A cross-dressing hillbilly named Doodlebug. This metatheatrical, taphophilic, true-to-life monologue resurrects and converses with the cadaverous — from Philly’s Laurel Hill Cemetery to a British colonial era graveyard in India to ancient Greek tomb worshippers. Is there a meaning to the universe? Is the spirit world speaking to you right now through this press release? If so it should be testable, no? Thrill as Stanley points to a tombstone and researches the forgotten dead beneath it, forming connections with the deceased who rise to the surface halfway around the world in a Kolkata graveyard, and in his own Appalachian family. Shriek and shimmy as Stanley worships the dead in song. Be amazed as a live seance yields messages for audience members. Psychism? Telepathy? Subconscious ideomotor impulses? Watch, decide, leave smiling, healed and redeemed. Jeffrey Stanley’s play Tesla’s Letters (Samuel French, 2000) premiered to rave reviews Off Broadway in 1999 and went on to national and international productions including the Edinburgh Fringe and most recently a Chicago premiere. He is a regular religion blogger for the Washington Post, and a performing arts faculty at both New York University Tisch School of the Arts and at Drexel University. Other plays include the 2003 Medicine, Man commissioned by the Mill Mountain Theatre in Virginia and most recently produced at Theatre Three Dallas, and Beautiful Zion: A Book of the Dead which premiered in the 2011 Philly Fringe. In the 2012 Philly Fringe he produced Bidisha Dasgupta’s classical Indian and modern dance show Einstein/Tagore: Seashore of Endless Worlds. He was a 2011-12 PDC artist-in-residence at Plays & Players Theatre. Stanley is a past president of the board of directors of the New York Neo-Futurists experimental theatre ensemble. He has been a resident of prestigious artists’ colony Yaddo, a Copeland Fellow at Amherst College, and a guest lecturer at the Imaginary Academy summer theatre and film workshop in Croatia sponsored by the Soros Foundation. He has appeared as a guest writer in The New York Times, New York Press and Time Out New York, and he was an editorial adviser to Boston University’s Center for Millennial Studies’ book on apocalypse movements The End That Does (Equinox Books, 2006). Stanley holds an MFA in Dramatic Writing from NYU Tisch and a BFA from Tisch in Film & Television. (rain date 9/19/13 6:30pm)Tickets: $10, purchased only in advance through the Fringe Festival website, http://www.fringearts.com. No tickets will be sold in person at the door.